A rainbow of flavors in Deep Eddy Vodka's tasting room. All photos by Sara Havens. Deep Eddy is a historic, man-made swimming pool located in Austin, Texas. Built in 1915, it's the oldest pool in Texas and was once a ritzy resort. Today, it's owned and operated by the city of Austin and is a popular hangout. 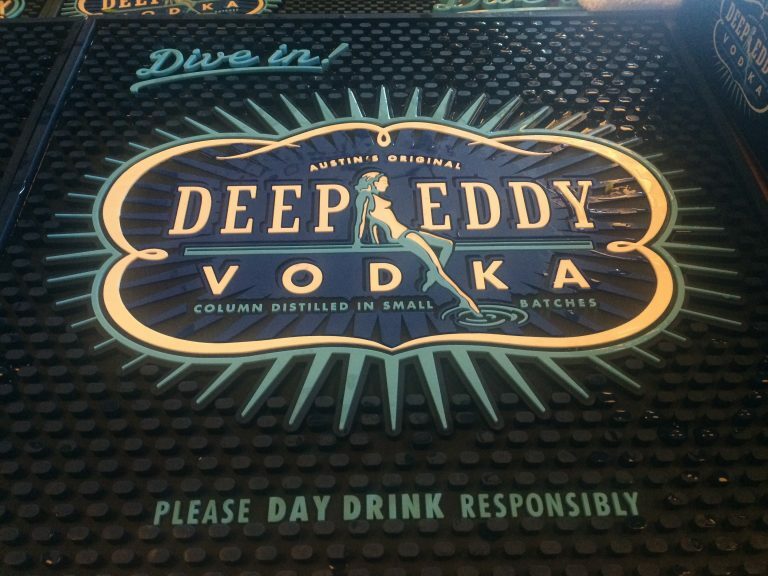 It's also the inspiration for one of Austin's most well-known spirits (along with Tito's Vodka), Deep Eddy Vodka. I took a recent trip to Deep Eddy Vodka and found a charming distillery that's actually quite similar to its namesake swimming pool — a place to hang out, catch up with friends, play corn hole and enjoy a tasty beverage. It's a destination distillery at its finest. But first, a little background on one of the country's fast-growing spirits brands. Deep Eddy Vodka was started by Austin entrepreneurs Clayton Christopher and Chad Auler in 2010. The two wanted to create flavored vodkas that were made with real fruit and natural ingredients, and their first product was Deep Eddy Sweet Tea Vodka. From there, they created Deep Eddy Vodka, Deep Eddy Ruby Red Vodka, Deep Eddy Cranberry Vodka, Deep Eddy Lemon Vodka and Deep Eddy Peach Vodka. The flavored vodkas are bottled at 70 proof, while the straight vodka is 80 proof. Deep Eddy took off in the midst of the flavored vodka boom, and, because the company touts premium, all natural ingredients, it also appealed to the craft movement of making quality spirits with real components. In 2015, Deep Eddy caught the eye of Kentucky's Heaven Hill Brands, which is known for its bourbons (Evan Williams, Elijah Craig, Larceny), and the company purchased it from Christopher and Auler for an undisclosed amount. Thankfully, Heaven Hill has taken a hands-off approach with Deep Eddy — if it ain't broke, don't fix it — and other than giving the brand a larger advertising budget, it allows the distillers and staff to operate as usual. Deep Eddy is located southwest of Austin in a small town called Dripping Springs. The polished and pristine 30,000-square-foot distillery offers daily tours and drinks by the glass in a 5,000-square-foot tasting room. The vibe is fun, lively and bright. On the day I visited, the outdoor area was teeming with locals playing corn hole, socializing around picnic tables and enjoying an array of delicious cocktails made with Deep Eddy vodkas. From Bloody Marys to Martinis, each vodka had a list of four or five suggested drinks that accentuated its flavor profile. As part of the full tour, a guide leads you through the distillery, where you see first hand their state-of-the-art Vendome column still used to distill their vodka 10 times, as well as the tanks where fresh fruit is brought it each day. They also run their vodka through charcoal filters six times to ensure flavors aren't stripped. The distillery produces 50,000 bottles a day. At the end of the tour, you get to sample each product and then choose a drink from the full-service bar in the tasting room. The Deep Eddy Lemon Vodka was my favorite of the six, while the Sweet Tea came in a close second. Our guide said the Ruby Red is one of their best-sellers, along with their flagship product, the Sweet Tea. Peach is the company's latest release. As my group chose our drinks (I couldn't pass up the Bloody Mary) and mingled with the folks outside, it was then I noticed that Deep Eddy was more of a destination than a distillery to its locals. They come each weekend to socialize, blow off steam and enjoy a cocktail or two — not take the tour and sip the free samples (although there are plenty tourists who come for that experience as well). In my opinion, that's the best of both worlds.